Berlin, Die Sinfonie der Grosstadt (2011) - We Insist! We Insist! 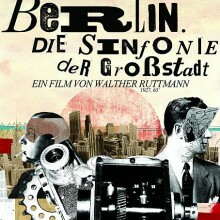 The band decided to work on this new project in 2010, writing an original music soundtrack to Walter Ruttmann's 1927 film "Die Sinfonie der Grosstadt". One of the main goals of the project was to respect the spirit of the original documentary without compromising We Insist! 's unique energy and sound. Through the discovery of this film's power, modernism, originality and anchorage in this thriving period of the Weimar Republic, We Insist! were inspired to write the music that would eventually metamorphose into some of the material found on the eponymous album, released February 2014. The cine-concert was performed live, often to sold-out audiences in France and Germany. "After all the entire art of film consists in nothing but a play of lights on a sceen, onthe painterly composition of the frame. A second element that appears – rhythm, the sequence of change between black and white areas. Abstract cinema has quite rightly been called 'the music of light'".